A few days ago, I was clicking through Wikipedia and stumbled on what may be my new favorite page on the site. 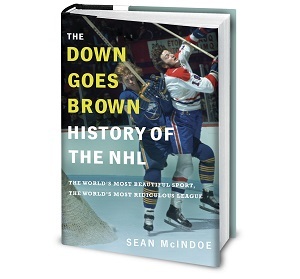 Titled "List of National Hockey League controversies" and promising "a list of controversies which have occurred in the National Hockey League over its history,” at the time I found it the page listed a grand total of… three things. Let's be honest — on a good night, the NHL will give us three new controversies before most of the game have hit intermission. And in 2016, as always, the NHL provided plenty of new entries to the ongoing list. Much of that was firmly in the no-laughing-matter category, as issues like the concussion lawsuit, Dennis Wideman's hit on Don Henderson and a steady stream of offside replay reviews had fans fuming. But other controversies of 2016 were just, well, dumb. They were the kind that had you shaking your head, rolling your eyes, and wondering "What are we even doing here?" Those are the kind of controversies that the league probably wishes would go away quickly, never to be mentioned again. Well, the Wikipedia editors may forget, but I don't. So before we flip the calendars ahead to 2017, let's take one last look back at the five dumbest controversies of 2016. Coaching in the NHL isn't easy. You work countless hours, you're measured on results that are largely out of your control and you have to deal with the media at every turn. And, inevitably, you get fired. But the firing itself wasn't the controversy. The big story here was the Gallant ended up taking a cab. Yes, apparently losing your job is just part of the game, but having to take a taxi to the airport is some sort of mortal insult. The Panthers' organization had already somehow become ground zero for every hockey hot take, but this was simply going too far. Those dastardly computer boys had probably outsourced their transportation policy to some new-fangled abacus!